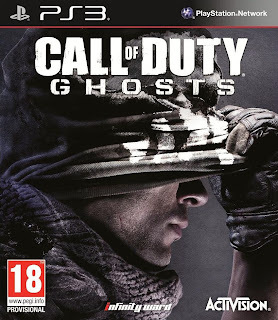 Today we are going to reviewing the up and coming title Call of Duty Ghosts for the available consoles PS3, PS4, Xbox 360 and Xbox One. Our mission is to provide an in depth review on this title through our experience. We try to keep our opinions and bias thoughts to a minimal. So Lets Get Started. First off to say the least the story begins on a broken street as you are playing a man by the name of Logan. Soon after you are accompanied by your brother, NAME , and their dog companion Riley. You eventually get to the end of the block running through broken terrain as it is falling apart behind you. This is considered to be your homeland and the end of the first mission. You meet up with your father, a man by the name of Elias. The first mission comes to an end in which the next mission begins to show a flashback mission in which you are up in space showing off some new tactical laser beam like orbital weapon in which it is hijacked and targeted towards major cities in the United States, Europe and South America. You fend off the other astronauts destroy the already active Odin orb mission just in time to watch your lady companion, NAME, die either from the explosion or from internal hemorrhaging. This is were the mission ends and begins on a stadium like environment in which the opposing enemy team led by a man named Rorke has all of his men and has captured their friend a Ghost agent by the name of Ajax. This mission featured the Barett 50 cal sniper will by far the longest range scope I have ever used in any FPS title. You soon enough drive one of their trucks through the fence of their operation blasting as many soldiers as you can. You make your way to the very top floor only to find Ajax dying only to say his very last words. On the wall of this place were all the hit lists and pictures of the men whom they killed in the Ghosts faction. You escape bring Ajax's body with. The next mission "Homecoming" begins in Santa Monica Ghosts faction military base in which you have to take control of a chain gun and a A110 Airstrike to take out the opposing team that are making their way onto your beach. The underlying task is find your father, Elias and make sure that he got out alright. This part doesn't last very long as your gun gets destroyed, the land beneath you gets destroyed from a helicopter launching a missile towards your position. You make your way through the man made trenches gunning your way past the enemies until you get stuck at a standoff gunfight in which you have to use your Strafe Run in order to kill the tanks, helicopters and enemy foot soldiers. On the final strafe your helicopters get hit and destroyed making it so you can't use them anymore. You make your way out of the trenches back onto the street were you meet up with Riley and go back inside a building at the end of the road. You run up the stairs only to not find your dad, get stabbed by a hit-man and saved from the Ghosts whom had repelled down through the building upside down. You find out your dad is the main leader of the Ghosts. The next mission "Legends Never Die" go back 12 years in which Elias and the Ghosts. were originally led by Rorke. Their mission was to eliminate General Diego Almagro. General Deigo Almagro wanted every United States citizen either imprisoned or executed. Rorke convinced washington to let the Ghosts handle it. You start off on a broken street running down the street only to find two enemy armored "daddies" in which you need to run away into a parking garage. You gun through enemies make your way to the other side of the street and take out the damaged missile truck by chucking a grenade inside. You run down to take out more enemies and try to take out another missile truck launcher in which it fires right when you get close. It launches into the dam flooding the entire city making you go into an alley then back through a building to the top floor. Kill some more people and the roof collapses underneath you. Making you get thrown through the flood only to be saved by Rorke. You silently kill a few men with Rorke's help and make your way outside on the rooftops. Crossing over a broken glass structure it begins to almost break apart. You make your way across to see a helicopter flying away and you are radioed-in to help out Merrick down the road. You make your way through a standoff gun fight and get through to Merrick. You get to the top floor just in time to jump onto Almagro's helicopter. You kill Almagro and the helicopter crashes only to have only one option is to let Rorke fall into the flooded streets below. The next mission begins in Caracas were to take on the role of Logen Walker. Your mission is to find a man that knows where Rorke sleeps. You launch your zip-line and go from building to building repelling on the side.You repel shooting enemies floor by floor until you reach the control center floor. You upload your virus onto their system and then let about 6 enemies pass by you when you hide in the shadows. Then you need to go back outside and then repel down forward activating your virus along the way. The virus kills the lights. You need to now take out the primary and secondary elevator. You make your way inside a lobby shoot the TV and then begin to take out enemies with this awesome stunning strobe light attachment. You take out the enemies, damage the elevator, get surrounded by more enemies and then repel out the window two floors down and back into the building. You fight your way through to get through to interrogate the man that knows of Rorke's position. He shows up on the TV and explains that Elias had left him to die 10 years ago. He brings to blow up the building causing it to slide everything out the windows. Luckily the Ghosts had parachute in which they opened up to safely landed. From interrogating the man they got his briefcase in which contained an encrypted file to where Rorke was hiding. It notes that he moved every 12 hours. The next mission begins to note that they know where Rorke's position in an oil mine facility. You start off driving an apache helicopter and begin to full on maneuver it around taking out cars, tanks, helicopters and boats up until you get to the end to land and get out. You make your way through the ins and outs of their warehouses and get to the top to captured Rorke. The tortured Rorke by keeping him in a hole. They begin torturing him on the plane by opening up the doors and threatening to throw him out. This is a bad move because Rorke's plan flies right between and his men come in and grab him. Logan, Merrick, Hesh and Elias get launched out the plane falling towards earth. Logan parachutes and crashed into the jungle. The next mission begins as you are crawling through the jungle and you have a silenced pistol, a motion sensor, and a tactical knife. You make your way through the jungle to regroup with the Ghosts. Your mission now is to get to the end of the river for evacuation. You need to sneak past a lot of enemies and then you see a bunch of trooping getting dropped off. You sneak by and duck in the grass to dodge a helicopter and jump off a tall waterfall to the extraction point. The next mission begins to explain the missile that was launch during the sneaking part of the previous one. You now have to infiltrate a andes mountain base and gather intel on their missile program. The game features similar like tactics and controls as it did in Modern Warfare 2 and Modern Warfare 3. The guns were given an appearance upgrade. Some guns even were directly taken appearance, stats and all from one game to another. Sort of like the copy and paste options found on computers. The image on the right was taken from our archived recordings. The gun features the same exact stats. Rapid Fire Rate, Fast Reload, Bottom clip and Less to no recoil. Seems like they were cutting some corners there don't you think? Unfortunately we were not able to access the Multiplayer and this section of the review will be updated as the title is released to the public. I hope you enjoyed reading as we would like to thank everyone who had contributed. We would also like if you were to give us some constructive criticism based upon on review in the comments below. It will only help us out for next time. As always stay tuned for the latest hacks and homebrew news.